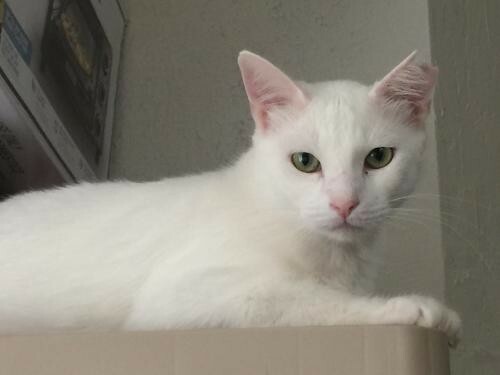 Please contact Beth (bethbach2@gmail.com) for more information about this pet.Alton is a gorgeous pure white boy with stunning yellow green eyes. He's nervous with new people but really just wants to be loved. He likes to just hang out with his kitty friends, watch birds, and take long naps. He's easy going with other cats and kittens. Alton was living outside, already ear tipped but was trapped and taken to a shelter with a very high kill rate. He's extremely grateful to get to live indoors now and will repay you for your kindness with lots of kitty love. Note: Alton came with two friends who were also trapped and taken to the shelter. He's especially good friends with Agnes II. She's the one you can see him hugging in some of the photos. His other friend is Alfreda.Visit this organization's web site to see any additional information available about this pet.